Puyloubier is the perfect base to explore Provence and the Cote D'Azur. Our house is less than an hour from beaches and seaside villages, 20 min. from the beautiful cultural hub of Aix en Provence, close to countless vineyards, hilltop villages and hiking trails and cycling routes, and 40 minutes from the lively metropolis of Marseille. It benefits from the spectacular scenery and quiet atmosphere of a village on the side of one of the most picturesque mountains in France, without sacrificing access to cultural, outdoors, gastronomic and other attractions. Nestled at the foot of Mont. Ste. Victoire, 20 kilometers east of Aix-en-Provence is the picturesque village of Puyloubier. It is just large enough to sustain a grocery store, children's playground and sports fields, primary school, post office, cafe, restaurant, bakery, and variety store, and is home to the award-winning local Cave Cooperative, selling wonderful and very inexpensive wine. From the house, visitors can walk up the mountain immortalized in the paintings of Paul Cezanne. The Non-Smoking house is a traditional 'maison de village' and the foundation dates back to medieval times. The interior of the house combines traditional style with modern amenities. It House at Pierre Jacquemet, and the neighbouring house, at Rue de la Paix, also for rent, each comprise five rooms and two bathrooms: the updated kitchen/dining room and renovated bathroom (with a shower but no tub), and the second full bathroom, the master bedroom with a queen bed, and second bedroom with a double bed, as well as the comfortable queen sofa bed in the living room of each house, each of which opens out onto large terrace upstairs. An additional single bed is available in the study of the Rue de la Paix house and the second bedroom of the Pierre Jacquemet house. Each sleeps five comfortably, 7 in a pinch. We have a bed and highchair for a baby/toddler as well as a stair guard. The main room in each place features a dishwasher, clothes washer, kitchen counter, dining room table, six chairs and easy chairs. A modern gas stove and North American-style refrigerator complete these rooms. The stone sink in the Pierre Jacquemet house and the master bedroom in the apartment are centuries old! Puyloubier is close to amenities of every kind, from Mediterranean Beaches to the cultural, market and shopping activities in Aix en Provence and Nice. The region is rich in cultural and outdoors activities, hosting many galleries, music festivals and theatres, as well as being a centre for hiking, mountaineering, cycling, and swimming. There are several children's amusement parks and adventure playgrounds, as well as beaches and pools for children of all ages. Historical and religious sites of interest abound locally, but perhaps most arresting are the beautiful landscapes which have attracted artists from Van Gogh and Picasso to the Canadian Group of Seven, who stayed in a house a few miles away. We are a retired couple who love the south of France, and travel here regularly from our base in Toronto, Canada. This village is the ideal location in southern france, and benefits from a vibrant civic life, with 120 local clubs and activities, including films, music and theatrical events throughout the year. We love the local wine, restaurants, hikes and most of all the scenery, which is spectacular throughout the year. The views from the terrasse are wonderful, and the sunsets spectacular. We love the peace and quiet, and the proximity to transit, hiking and great food, wine and restaurants. no dryer but clothes drying racks provided! An assortment of board games and cards is available. So beautiful, it inspired us to get married! My now-husband and I stayed at Beth and Tony’s home in Puyloubier for a week in May of 2016. Her home is warm, cozy, and beautifully decorated, with a well-equipped kitchen for cooking and comfortable bedrooms. The rooftop terrace is particularly nice for outdoor dining (I think we ate nearly every meal out there). The village of Puyloubier is the perfect size for exploring in a day, picturesque and charming without being at all touristic. The house is located centrally, right near the small grocery, a bakery, and a cafe. The nearby village of boasts a fantastic market, perfect for buying fresh bread, fruits, and vegetables, and the locally made wine is a good value for the money. If you are interested in seeing lavender fields, Pulyoubier is a good location for day trips into lavender country. Not only were Beth and Tony excellent hosts and great at communicating, the local caretaker, Eric, was friendly and helpful without being intrusive. A memorable vacation was made even better by having such a lovely home base. And if you're looking for romance, you may end up like us: so inspired by your surroundings that you decide to get married! We are so happy for you both, and delighted that you enjoyed your stay in our house in Puyloubier! 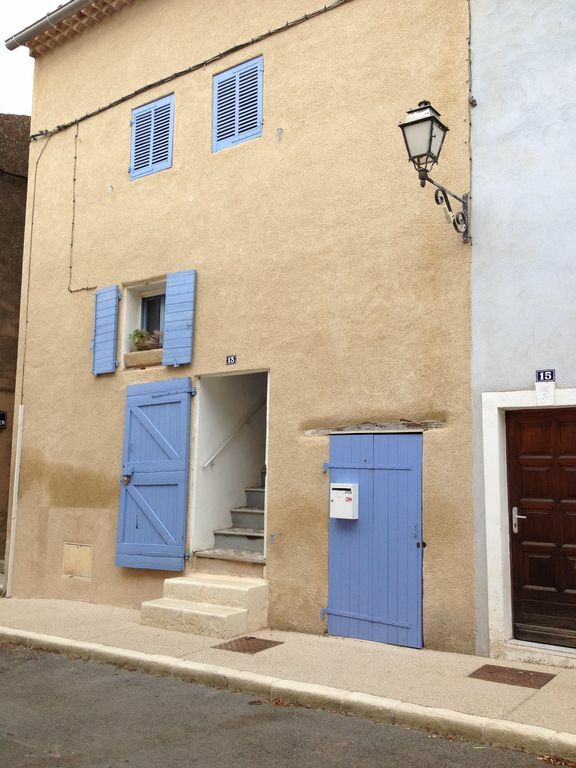 We used this house in this typical provencale village as a base for 5 weeks in April. Firstly Beth and Tony, the owners, were wonderful to communicate with. We loved the location, the house was well equipped, excellent wifi and plenty of room for us as a couple. English speaking couple available to help with any issues - though none arose. We had family and friends visit us for weekends from England, which worked well. The local village was really friendly, a little shop, bar and restaurant. And it was easy to get to Aix-En-Provence by the regular bus, and we loved spending time in its pretty streets and lunching in squares and the markets. There is a very nice cafe in the square but it didn't open for food until towards the end of our stay around 7th of May. The house itself is really well equipped, especially the kitchen, and feels like a home. The only reason it wasn't a five star is that the shower/bathroom situation gets a little pressed with four adults in the house, and the stairs and living area are awkward if you aren't mobile or are tall, couple of banged heads. It worked really well for us though as a couple with occasional guests. Favourite restaurants nearby - Auberge Des Banettes, looks like a nondescript place on the side of the road on way to Aix, but inside has most beautiful terrace view and really great, exceptional value french menus - we went every week! Trips to Arles, Marseille, Nimes, and the nearby St Maximin were just a few of the other spots we tried. You'll never get bored of the view of the mountain and driving through the vineyards, or drinking the terrific rose wine from the cave cooperative across the road. We would definitely go back. Set in a non-touristy charming little village at the foot of the spectacular Mont Sainte Victoire, this homey, three-level villa felt like a warm family embrace to our family of four. Owners, Beth and Tony really want their guests to enjoy their stay and it shows. This was our families' third stay with hosts Beth and Tony. We enjoyed a meal with Beth and Tony upon our arrival! This cozy villa has everything one needs as well as a terrace with a barbecue outdoor table and chairs and a spectacular view of the mountain. Eric, the local person who looks after the house, is readily available if needed. Beth and Tony ensure their guests have lots of information about the area and even went and checked out vegetarian restaurants in the area for our vegetarian daughter! Their two villas are perfectly situated for day trips in all directions for sites in Provence. We visited Nice, Cannes, St. Paul de Vence, L'Isle sur la Sorque, the Gorge, Chateau des Baux, Avignon, Arles and Aix en Provence (20 minutes away) several times. There is so much to see and do from here. Access to the Mediterranean is quick and easy and the area is rich with hiking trails. We were delighted to discover a new high end spectacular restaurant, Relais de Saint Ser on the outskirts of Puyloubier. We also discovered a Michelin star restaurant about 15 minutes away. Looking forward to our fourth visit! We spent three months and are coming back for more to this delightful home in the wonderful village of Puyloubier. The home is perfectly set up with everything needed, just like being at home. The owners really care that your vacation is everything you expect. The village is charming, surrounded by vineyards and amazing walking trails. We are so glad that you enjoyed your stay, and look forward to hosting you again! What a delightful home in a beautiful part of the world. Our family of 4 spent three weeks in this gorgeous house. The space is well-renovated and thoughtfully equipped. We felt well-informed and welcomed to use the house as our own. The communication with Beth before, during and after our stay was exceptional - it makes such a difference to know you can make contact as needed. Friends in the village are also on hand for any issues as they arise - not that we had any, but reassuring to know they were there. This home is ideally placed for discovering Provence. Puyloubier itself is a lovely little village, there are so many places to visit nearby and many others again just an hour away. We are so happy we found this gem and that Beth was able to accommodate us. Thank you Beth, a very special family time was spent in your home. Meine Frau und ich durften drei Wochen in diesem wunderbaren, uralten Gemäuer verbringen. Besonders die Dachterrasse mit wunderbarem Weitblick hat es uns sehr angetan, wir haben jeden Tag im Freien gegessen, auch wenn die Abende Anfang Mai noch etwas kühl waren. Die Abwicklung hat per Mail super funktioniert und kaum waren wir Zuhause, hat uns Beth sofort wegen der Kautionsrückzahlung kontaktiert. Vor Ort kümmert sich Erik um eventuelle Probleme, bei uns war es die Waschmaschine die streikte, aber bereits am nächsten Tag hat Erik eine Neue beschafft und angeschlossen, sodass wir noch am Abend unsere verschwitzten Kletterklamotten waschen konnten. Einen besonderen Dank an diesen wunderbaren Menschen. Besten Dank auch an Beth die uns Ihr Haus überlassen hat, wenn es uns möglich ist, kommen wir gerne wieder einmal zurück, hier könnten wir uns sicherlich auch länger als drei Wochen wohlfühlen.